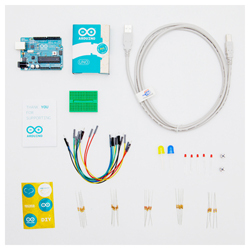 Description: This kit contains all of the essential parts needed to start learning and using the Arduino. Mini Breadboard Chef's choice: Comes in; White, Black, Blue, Green or Red. Premium quality 6" M/M jumper wires. Set of ten. No soldering required. This kit contains jumper wires and a solderless breadboard. A computer is all you need to program the Arduino. Depending on availability, the kit may contain a surface mount Arduino UNO. They are functionally equivalent. Checkout the Arduino Home Page, here you can download the Arduino software for Mac OS, Windows or Linux, find reference materials and example Arduino Sketches.